Q & A: What do you eat while traveling? What is “Healthy”? I talked about Eating Healthfully On the Road last week. Funny thing is that we were on the road for the past two weeks, traveling down to Florida for work. 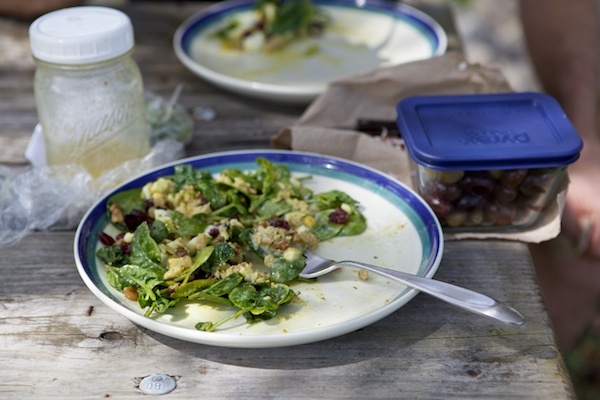 We stopped at Biscayne National Park in the early afternoon on February 27, 2012 and enjoyed a delicious healthy meal from things I had packed the previous week. Spinach from a local farm smothered in a homemade mustard yogurt dressing topped with hard boiled eggs, dried organic cranberries, crispy soaked walnuts and some tuna salad I had made before we left. It was healthy, delicious and filling. It was also super quick! If you notice I always travel with real plates and silverware – no paper, plastic or anything of the sort. I carry some non-toxic dishwashing detergent and sponge. It only takes a few seconds to wash up the dishes and the meal is so much more satisfying when enjoyed with real silverware! What’s your favorite on the go meal? Love it! While living in Germnay I was struck by the way people would stop and eat on trips, always from baskets and coolers and often with real dishes. They would wash them before heading on their way. The camp grounds we stayed at had sinks in the shower areas just for dish washing, I loved it but it seemed odd to me. Now that we are back in the States I am on the other side of the fence and I find the frantic “throw away” pace sad and frustrating. Happily my kids like doing as much the “old fashioned” way as they call it as I ask, and are always happy to jump on board with good, clean, sustainable ideas. I like to imagine how they will take these expierences and habits into adult life.